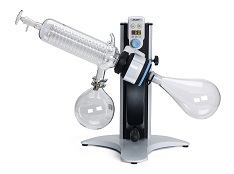 A Rotary evaporator is a distillation unit that incorporates an efficient condenser with a rotating sample flask. As the flask containing the solvent is rotated, it continually transfers a thin layer of liquid over the entire inner surface. This gives a very large surface area for evaporation, the sample or Florentine flask can additionally be heated by an accessory bath to accelerate the process. 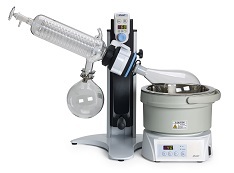 The entire system has been designed to be vacuum tight, an accessory vacuum pump can be connected to reduce the overall pressure and hence the boiling point of your sample. There is also a plastic coated version available, providing additional safety when using the glassware under vacuum. The plastic coating ensures, that operator injury is less likely, should any glass component fail while under vacuum. The added security of a plastic coated also gives the operator sufficient time to transfer any potentially dangerous chemicals to a suitable vessel without spillage.